Groysman stated concern over the opening of "DPR's honorary consulate" in Ostrava. 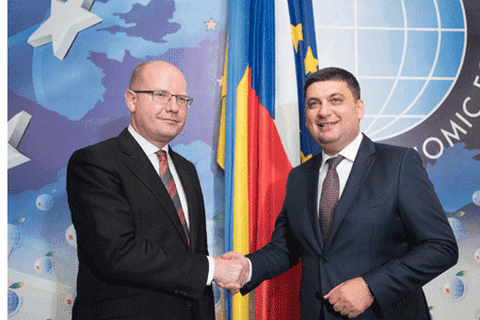 Czech Prime Minister Bohuslav Sobotka assured his Ukrainian counterpart on 7 September that neither "DPR" nor "LPR" will be allowed to open their representative offices in his country. Both heads of governments are now in the Polish town of Krynica-Zdroj, where an international economic forum is held. Czech Prime Minister assured that Ostrava institution cannot be considered a diplomatic mission and no terrorist organization operating in the occupied Donbas will not have a diplomatic mission in the Czech Republic. On 1 September, it was reported that "DPR " opened an office in Ostrava whose purpose was to disseminate in the European Union "truthful information about the unrecognized country." The institution is not accredited with the Foreign Ministry and has no diplomatic status. After that, the Ukrainian Foreign Ministry demanded from the Czech Republic closed the mission.